But, every cloud, even the darkest and most threatening, has a Silver Lining and, in Trinidad and Tobago, this silver lining is not a metaphorical expression but also a physical reality. It is a Foundation which serves as a guardian body for marginalized youth to prevent bullying, suicide and discrimination, centered on youth with regards to LGBTQ issues. While the “LGBT” stands for Lesbian, Gay, Bisexual and Transgender, the “Q” is about questioning, not just sexual orientation but how our society reacts to it. We all need safe spaces – both physical and psychological comfort – and the Silver Lining has recognized that there are three key measures in fighting inequity – support, education and advocacy. As the Member of Parliament for San Fernando West, I have worked with my constituency, especially all the schools in our city and its environs, to try to minimize if not entirely eliminate bullying in schools. It does not matter how a child looks, thinks or behaves, every child is precious and must be protected. As the Minister for Public Administration with responsibility for scholarships and for the transformation of the public service, I believe that the road from gold to diamond, the journey from dependency to self-sufficiency, and the path to sustainable national development, has no room for discrimination or stigma. We are all equal in the eyes of God and the Constitution of our country and everyone’s rights must be respected and protected. 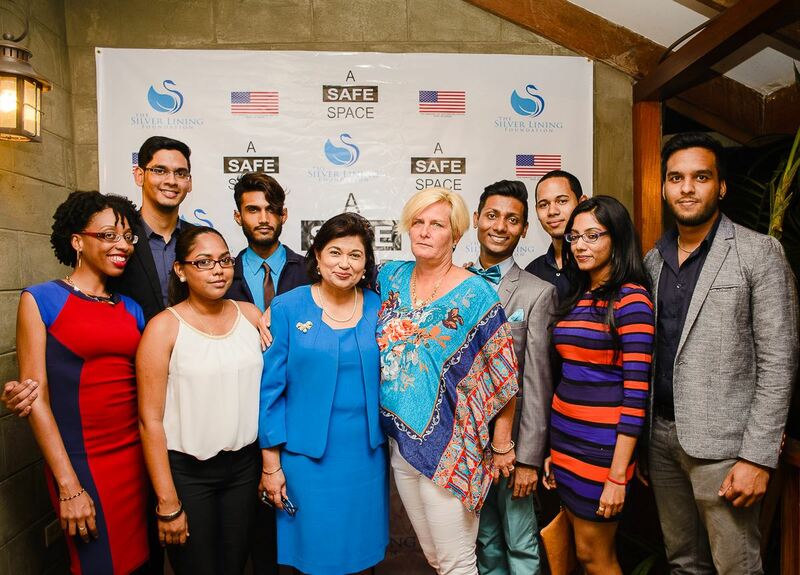 This short film, “A Safe Space”, breaks new ground for our country. It brings into the open an issue that has divided families and communities and subjected those who have different sexual orientations to verbal and physical brutality, pariah status and isolation, and worse, callous disregard for their rights as citizens of a republic which is committed to respecting the rights of all. Even now the battle rages on with greater intensity, fuelled by people of LBGT persuasion seeking to exercise and enjoy fully their political rights. We must understand, appreciate and digest this fully. People don’t “play Gay”. In fact, “gay” might be the wrong word to describe the process of coming to terms with their sexuality. It is for many “Gay” people a harrowing experience made worse by the society the surrounds and sometimes seeks to smother them. What this film does, what the US Embassy has made possible and what the Silver Lining Foundation has helped us to appreciate, is the need for a supportive environment, one that is enabling, one that is tolerant, one that uses all the talents and all the differences among all its members positively instead of negatively. Research on innovation and creativity has proven that the most creative societies are those which are the most diverse in all aspects of life and living. When we look at Trinidad, especially our talent for innovation and creativity, we must recognize and respect the diversity which makes it possible. This diversity for which we are famous has allowed Trinidad and Tobago, a country with a small population and relatively minimal natural resources, to impact on the culture of the world way beyond our size and natural attributes. Consider how much more effective we will be, how much more powerful, how much more impactful, if we allow everyone in this country, every creed and race, ever region and orientation, to have an equal place. If and when that happens, God will truly bless our nation.